General (Gen.) Hugh Shelton, the 14th Chairman of the Joint Chiefs of Staff, author of Without Hesitation-The Odyssey of an American Warrior, and current Red Hat Board Chairman will be hosting. The 'Open Your World' Webinar will take place on Wednesday, February 16th, 2011 from 2:00-3:00pm EST. It's free to attend but all attendees must register before the event. In Without Hesitation-The Odyssey of an American Warrior, readers will come to see leadership learned, leadership applied, and leadership shared. Throughout Without Hesitation some for of the word "leader" was used over 150 times, "thanks" was expressed almost 100 times, "prepare" over 75 times, "share" almost 50 times, "honest" over 20 times, and "integrity" over 20 as well. Leadership, gratitude, being prepared, sharing and being open, not to mention having integrity and being honest are all terms that good leaders know and live by. In his acknowledgements Shelton says, "without those whose inspiration, encouragement, and persistence this book would have not been written." Gen. Shelton also uses the same sentiment— inspired, supported, assisted—about those—from Presidents to privates—whom he has been associated with throughout his journey into America's history and hearts. Without Hesitation is gilded with something better than gold—Inspiration. Great leaders inspire; and those who take the time to read, absorb, acknowledge, and apply the lessons of leadership that Gen. Shelton shares throughout the pages of Without Hesitation will come to understand leaders aren't just born they are made. Gen. Shelton, in Without Hesitation , inspires though his presentation of those lessons he learned throughout his childhood, teenage years, college days, and throughout his military career. The book unfolds in the shadow of Gen. Shelton telling what would undoubtedly become the greatest obstacle opportunity of his life—to overcome a spinal cord injury and not only live, but walk, to tell about it. 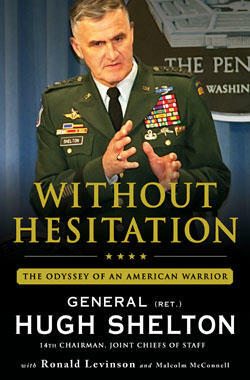 In 568 pages not only does Gen. Shelton share his lessons in leadership he mentors the reader with each turn of the page. The acknowledgement ends with, "As I have learned over and over, faith, family, and friends are indeed the greatest treasures of life." Throughout Without Hesitation Gen. Shelton explains how he learned and embraced those "greatest treasures of life." Knowing when to ask "What am I missing?" Being the best and doing your best no matter what the situation or job you are presented with. When a horse throws you get back up on it., The world keeps turning-Missions keep going-You must press on. You fight like you train and you train like you fight. There are many inspirational ideas you'll find along the way, think through their implementation. "You have to treat people right...never forget what it's like at the bottom." Apply yourself, do the best possible job, good things will happen in the end., and more. The lessons listed above are only a few of those lessons the Without Hesitation has to offer, read it an you'll find more lessons as well as how he overcame the spinal cord injury that could have just as easily taken his life. As I mentioned above Gen. Shelton will be hosting a webinar on Wednesday, Febriuary 16th, 2011, and he'll cover many things from his book and tie those leadership lessons into Open Source. I had the opportunity to send Gen. Shelton a few interview questions before had. He took the time to answer a few of them and as for the others we'll have to watch the webinar. However, here are a few of his answers. Amber Graner: How did you get involved with open source? What was the first Linux distribution you saw, and when? Gen. Hugh Shelton: In 1994 while serving as the Joint Task Force Commander leading the invasion of Haiti. I will talk about this is some detail at the opening of the webcast. After retiring from the military I had the opportunity to join the board of Red Hat and was excited to do so since I was a GREAT believer in open source by that time. AG: Where in your opinion could tactical units benefit from the use of open source? If these units are currently using open source technologies could you give some examples of its successful implementation? GHS: To be frank, I no longer track the internal operations of military units. For the last 10 years, I have been focused on the national/international operations and the strategies associated with the the potential use of force around the world. Having said that, I use every opportunity to inform our military/defense leaders of the advantages that open source provides such as speed, security, flexibility, etc. and encourage them to contact Red Hat for a demonstration of the significant advantages open source offers! AG: How can organizations such as Red Hat with Fedora or Canonical with Ubuntu begin to introduce Linux and other open source technologies to FRGs, military schools, and other civilian support organizations so that the opportunity for successful implementation can be established? GHS: It's all about contacting the organizational leader(s) and selling them on trying the product. Continued publicity/advertising/articles whet their appetite, BUT ultimately it's about convincing them to try the OS, which will then sell itself. AG: Whether it is training a soldier for battle or a Family Readiness Group leader, the Army and its associated support groups have effective training programs, if someone wanted to adapt any of these to a volunteer FOSS community how do you think this would best be accomplished? GHS: Same as above! Once established in one group, they will serve as a great proponent for the others. 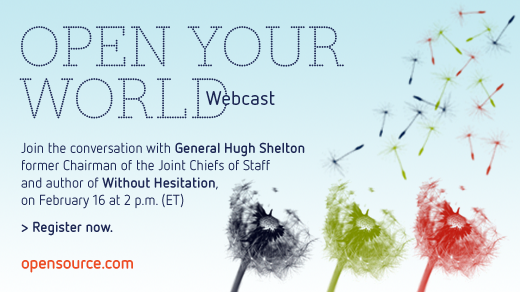 Many thanks to Gen. Shelton for taking the time to answer a few of my questions prior to Wednesday's Webinar. If you haven't yet signed up you can find all the information about the 'Open Your World' Webinar on the opensource.com website.